The Monkey Museum is a site where Cranky Kong has taken up residence in Donkey Kong Country 2: Diddy's Kong Quest. There is an establishment in every world, including the Lost World but not including The Flying Krock. The Monkey Museum is the successor to Cranky's Cabin from the first Donkey Kong Country. In the Game Boy Advance remake, Cranky Kong resides in a new location similar to the Monkey Museum, Cranky's Hut. Here, he does not only provide information but also hosts the minigame Expresso Racing. Like Cranky's Cabin, the main purpose of the location is for Diddy and Dixie receive tips and advice from Cranky. Most of it reveals Bonus Area entrances amongst other collectibles such as DK Coins. The background music is even based on the original theme for Cranky's Cabin. 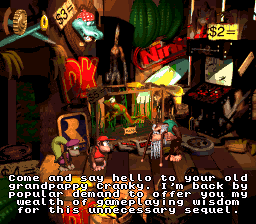 Cranky does not rant as frequently in Monkey Museum, usually only doing so when the Kongs enter and exit the location. Monkey Museum can be considered as an enhancement to Cranky's Cabin. Instead of providing random advice regardless of the location, the Kongs select their advice from a dropdown menu, which changes based on the world. The advice covers every level of each world, and is usually priced at one to three Banana Bunch Coins. However, the first one or two options are usually free of charge. The menu options are organized from least to most expensive. The Monkey Museum may also double as a typical museum, as it has various artifacts in the background. An oversized Super Nintendo controller. The Japanese and PAL version of Donkey Kong Country 2 have the red, blue, green, and yellow buttons while the North American release has the lavender and purple buttons. This directly reflects on an actual Super Nintendo's differently colored buttons based on region. A Killer Instinct arcade cabinet, which appears to be on sale for two dollars. A Donkey Kong statue appears above the arcade cabinet. A poster of Chief Thunder from Killer Instinct. Funky Kong's surfboard from Donkey Kong Country. A mounted Kruncha head, which is "on sale" for three dollars. It is based on a typical mounted animal head. A motionless Winky figure, shown to be priced at five dollars. A tipped over Mine Cart. Cartridges which resemble Virtual Boy ones. Background in the North American release. Background in the PAL release. Pre-release image of Monkey Museum in the Nintendo Player's Guide. A Rambi and Enguarde each appear in place of Expresso and Winky. Concept of the Monkey Museum, called "Cranky's Mobile Museum"
Cranky occasionally asks the Kongs if they have tried the game "Cranky Kong Country", which he claims was on sale a year ago. In reality, this is directly based on Donkey Kong Country's release a year earlier. Even though he dislikes the game, Cranky takes credit for causing its popularity instead of Donkey Kong. This implies that he might have been jealous of the game. In Donkey Kong Country 3's Game Boy Advance remake, Cranky has a dojo, where he trains himself for the same adventure, Cranky Kong Country, likely hoping for a successful game starring himself. Cranky is often seen restraining himself from hitting the Kongs with his walking stick. In Cranky's Cabin, he would whack Donkey Kong and Diddy every couple of seconds. This was most likely changed in response to controversies over child abuse. This page was last edited on September 4, 2018, at 09:37.